I recently stumbled upon a box of old, “vintage” glass jars. I knew they were too good of a treasure to just recycle, so I set them aside until my creative muse could come up with the right idea. My first reincarnation for these unique jars was as etched vases. You can etch any design you wish into the glass, but I chose to do a series of the unique styles of jars, all unmatched, and spell out the word BLOOM. 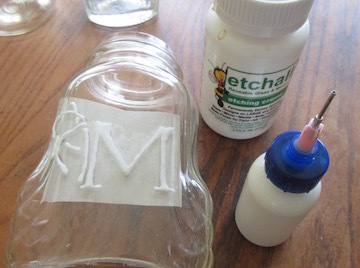 A single letter could be a great “monogram” vase too. A bit of jute twine and voila – you’ve got a set of unique, rustic vases with a bit of a vintage feel. Glass jars – I used vintage jars, but you could repurpose any glass jar for this project, use Mason jars, etc. Wash and clean jars thoroughly. The jars I used still appear cloudy in some areas – this is because they are indeed vintage jars and were found in a dusty old barn, and were quite dirty when I found them. I washed them, but I didn’t want to totally remove their “vintage” feel so I left some of the cloudiness on purpose. Use fine point permanent marker to trace letters BACKWARDS on transfer paper that comes with the Etchmask kit. Cut out a square around each letter. Peel off the backing from the transfer paper – you will see that the letter still shows through the paper, showing through in the correct way on the sticky side of the paper. Place the paper inside the jar where desired. This is your pattern. 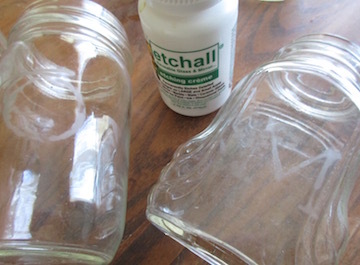 Fill Designer Tip Kit bottle with etchall creme. Add fine point tip. 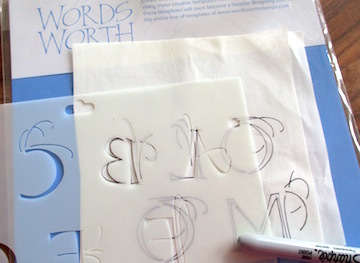 Follow the pattern for each letter and fill in with etching creme. Let set 15 minutes. At this point I washed my jars to remove the creme, but had I used more of the creme I would have returned it to the bottle for later use as etchall creme is re-usable! Let dry. 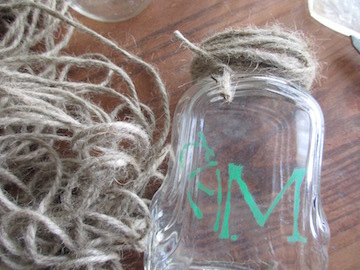 Wrap jute twine around the top area of each jar to hide the “screw on” area where the lid would be. Next Post: You can make this Upcycled Kids Table! Cool project …neat way to use those vintage jars.